It’s perfectly normal to desire to have a perfectly white smile. For starters, it improves your self-esteem, but it also has a great impact on how others view you. The latter is echoed in the results of a recent study where people were surveyed about the importance of the appearance of a person’s teeth. In one data sample 73% said they would be more likely to trust a person with a nice smile than someone with a flashy car or stylish wardrobe. That says volumes about the importance of how your teeth look because the type of vehicle you drive and clothes you wear are big-time status symbols in our society. 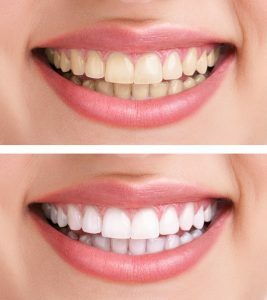 One of the methods available to perfect your smile and ensure that you make a positive first impression is teeth whitening involving hydrogen peroxide. But how do you know that it’s safe to use? Thankfully, your Longmont dentist weighs in with some answers. Hydrogen peroxide is one of the most common ingredients used for teeth whitening by dentists and in at-home whitening kits. Used correctly, it is a safe and effective way of removing stains. Hydrogen peroxide acts as a bleaching agent and can be found in whitening toothpaste. It can be combined with baking soda to polish your teeth and gently remove common food stains. The two ingredients magnify the effects of each other, delivering a bright smile. The baking soda provides a degree of abrasiveness that agitates the built-on material while the peroxide brightens the color of your enamel. Where Do Dental Stains Come from? Over time, your teeth can take on shades of yellow or brown. This is because the darker colored residue from food or other substances fill the pores in your tooth enamel, leaving a dull appearance. The at-home teeth whitening kits that you can purchase over-the-counter will be far less powerful than that which is used by your dentist in Longmont, which can be up to 40% stronger. Still though, this method of whitening can only address extrinsic stains. For deeper discoloration, your dentist has other options available for you. To find out which is the better route to take, feel free to reach out to your local teeth whitening expert to schedule a consultation so that you can get on the road to a beautiful smile and increased confidence. Then the next time you meet a new person, they’ll be positively impacted by how your pearly whites gleam. Receiving his Bachelor of Science degree in Finance from Trinity University (San Antonio, Texas), Dr. Dan Maurer would later go on to follow in his father’s footsteps and become a dentist by earning his Doctor of Dental Surgery degree from the University of Colorado School of Dental Medicine in Aurora. A native son of the Longmont community, Dr. Maurer practices at Longmont Complete Dentistry and can be reached for more information through his website.